This is a Cuban kids song All Around This World jazzed up with a merengue arrangement. A cachumbambe is a seesaw. Take a listen to this version from the Florida Folklife from the WPA Collections, 1937-1942, currently held by the Library of Congress. The original version has Old Lady Ines, a beloved archetype of the super-strong Cuban “little old lady,” smoking tobacco but refusing to drink coffee. After much deliberation, All Around This World chose to bring Ines to the U.S. and put her on a health kick, keeping the reference to Cuban coffee but changing the lyrics to suggest she’ll drink guarapo, which is a drink of raw sugar cane juice. How dare we do such a thing to a Cuban kids song?? Not as a slight to the tradition of the hardy Cuban woman! We decided to bring Ines to the U.S. in song in a way that American kids may be more inclined to relate to her, and nowadays cigar-smoking grannies in the U.S. are few an far between. Though, in retrospect, we certainly could have kept a little kick in her and had her eschew the guarapo in favor of a thick cup of coffee. In class we’re able to right this wrong by letting the kids know that Ines may occasionally choose a mild sugary beverage, but she didn’t live long enough to earn the right to be called “Old Lady Ines” by playing it safe. Thanks to Nestor Baguier for helping us see the light. Que bebe guarapo y no toma cafe. She will drink guarapo but she won’t drink cafe. Engineering and co-production of drums, bass and keyboard by Mark Wolfe at Audio Mind. 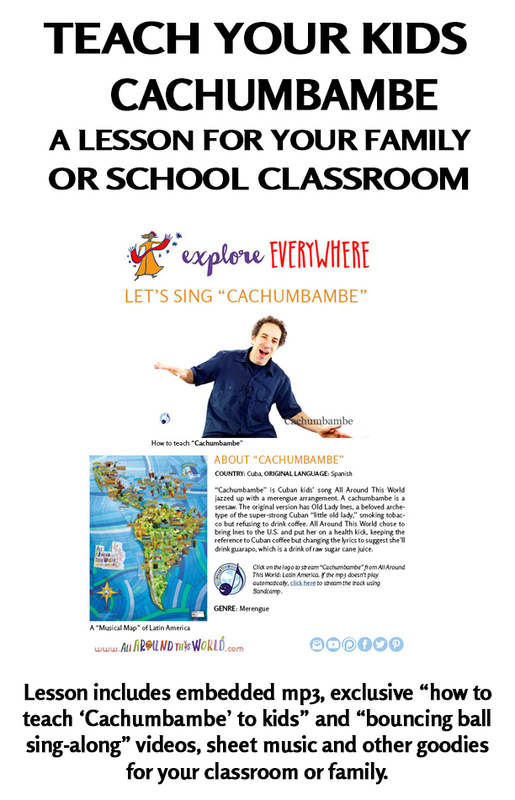 "Cachumbambe" is traditional, Englsh lyrics and Arrangement by Jay Sand. Instrumental arrangement by Arturo Stable.